A structured 12-week ‘quick-fix’ for Year 6 children who have not yet grasped some key mathematical concepts. Provides a range of diagnostic tests, lesson plans and activity sheets differentiated at Levels 3, 4 and 5. Curriculum charts to ensure full coverage of end-of-year objectives. Make sure children are fully prepared with advice on setting up booster classes. Perfect for whole-class teaching or group work. Easy-to-use teaching notes to keep SATs terrors at bay. 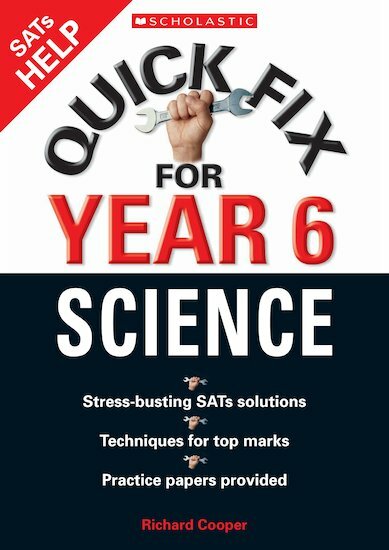 Teacher Mrs Sarah Gorman looks at Quick Fix for Year 6 Science for us. It contains 30 complete revision lessons, including, for each occasion, an introduction, complete lesson, review, lesson objectives and differentiated worksheets. In addition 3 key points are highlighted using child friendly language, so no need to rewrite the text book into something the children can use and they aren’t overloaded with facts and information! Each lesson is designed to be 20 minutes, fast paced and therefore energised and engaging for the children. And all this with minimal preparation for the teacher. The book provides 3 checklists, the most useful of which gives you simple targets on skills required to reach level 4. 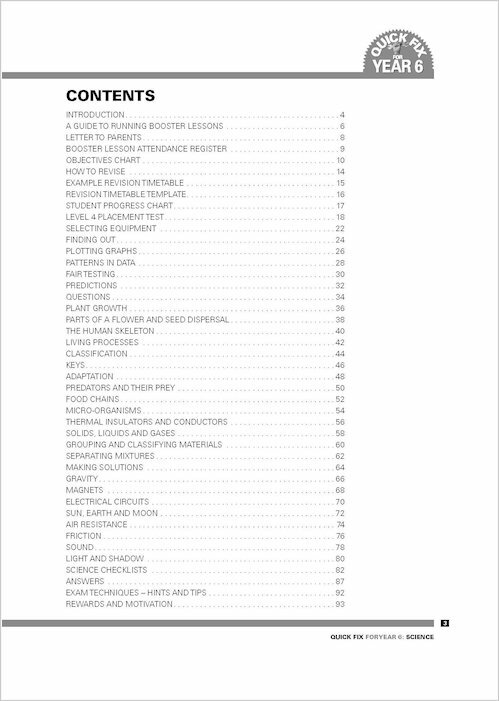 It also includes pages that will help parents understand the goal orientated nature of modern teaching, explaining what you need to be able to do or know. The resource is adaptable, so it can fit a part lesson, whole lesson and can be utilised into so many different areas during the weeks leading up to the tests. Your less confident pupils will love it because it’s broken down into manageable chunks and they are not bombarded with facts and theories, and therefore have less to remember. Throughout, the use of non-specialist user-friendly language means that teachers, pupils and parents are not confused by educational language. Attainment targets are summarised into straight forward bullet points, giving a simple point of reference for science The only thing that I could think of that would be useful is the facility to use a white board for larger groups or class work, which would be beneficial. This book is a complete revision pack for teachers, whatever their level of expertise. It is particularly useful for teachers who are new to Year 6 and the associated SATs tests. Cost effectiveness in terms of educational aims and results – not just price. Firstly, what a great price given the extensive benefits I can see here. It even has a section to assist in the development and management of booster classes, including a letter ready for parents, certificates/rewards and a register of attendance.